Hey friends! 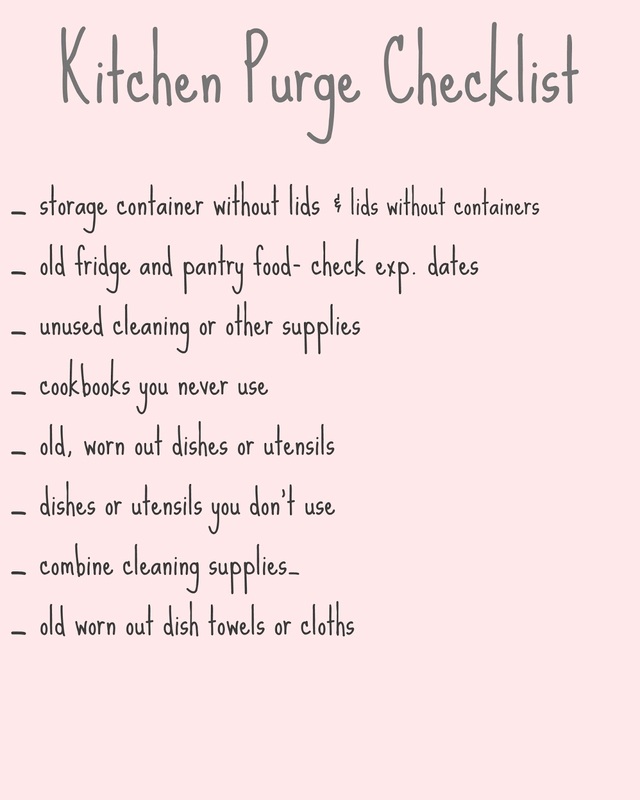 I am so excited for today’s post because today marks the first day of the 4 week declutter and organize your home challenge, starting with the kitchen. This challenge is hosted by myself and the rest of my friends from No Place Like Home. This series will be full of ideas and incentive to organize your home! There is just something about the start of a brand new year that makes me want to get my home in order and purge, purge purge! 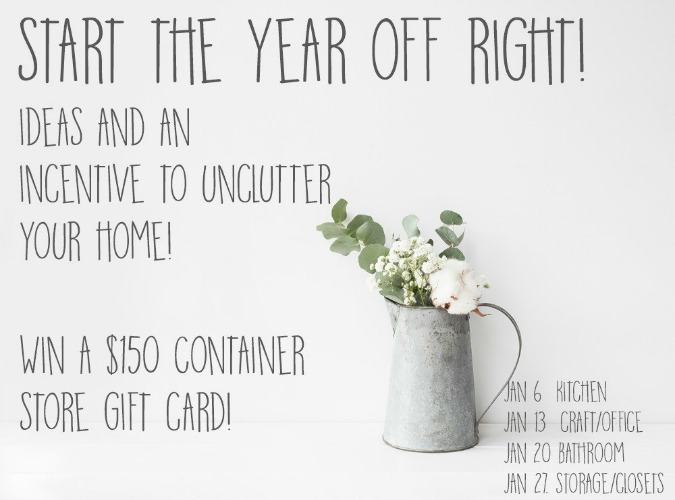 Not only do we have some very useful tips and tricks for you to help you get your kitchens organized, but we are hosting both a link party and a giveaway for a $150 Container Store gift card! 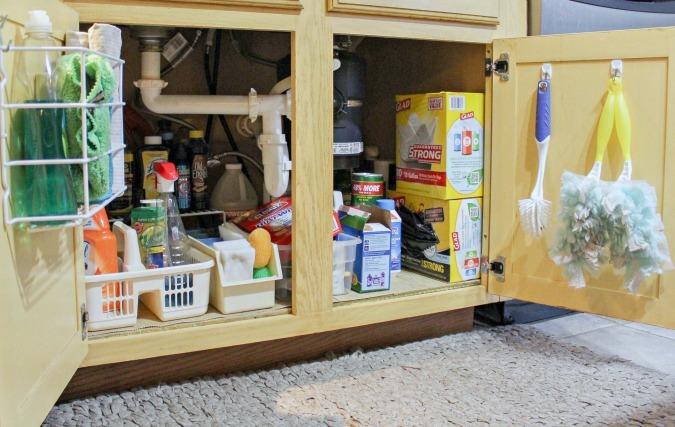 We invite you to please link up your kitchen organization posts. Or if you do not have a blog, you can just link up a picture if you like, and then be sure to enter to win the gift card! And please mark your calendars so that you can be sure to join us for the rest of the month, when we will focus on a different area in our homes each week. Also, please be sure to visit each of the other hosts at the links below to see how they have organized and decluttered their kitchens! 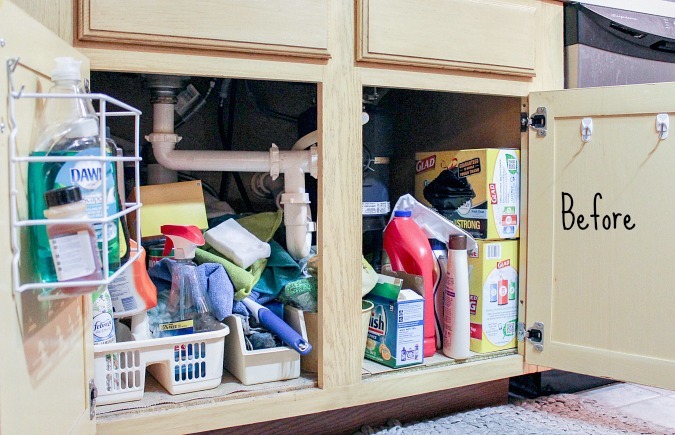 I chose to focus on two certain areas of my kitchen, the pantry, and my under the sink area. The rest of my kitchen is pretty organized, but these spots were badly in need of some tender loving care. 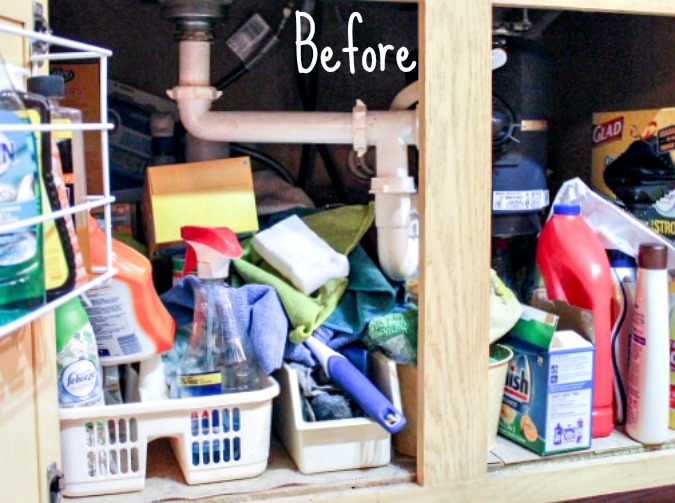 I have organized both of these areas in the past, and even blogged about them here and here. But over time things tend to pile up and get cluttered when we are living our busy lives, so it was time to do another purge and some more organization. And before we get started today, let me remind you that I am the girl with champagne taste and a tight budget. I like to keep it real around here, so my organization is not particularly lovely, expensive, or matchy matchy. For the most part, I keep my food in the containers they came in, with only a few exceptions. 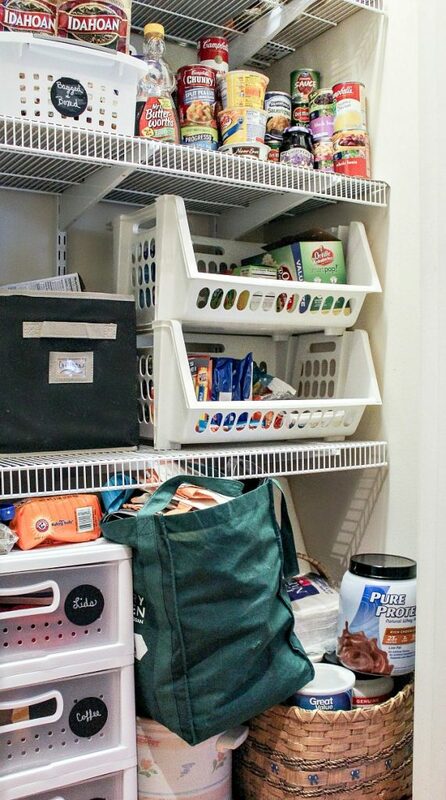 That is not to say that I don’t love to look at perfectly organized and gorgeous pantries or closets, it is just not my reality and it’s not how I roll. Maybe one day, when my entire house is finished and I have time to kill, I’ll get to that! Ha! To kick things off, I have provided a picture of the finished space that is labeled with where I placed things. 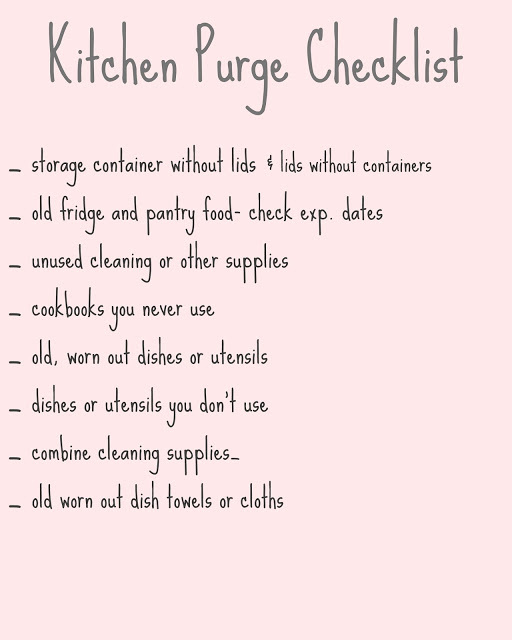 I’ve have also included a very handy checklist that you can use to help you get started in purging your kitchen. I will be providing these lists each week of the 4 week challenge. 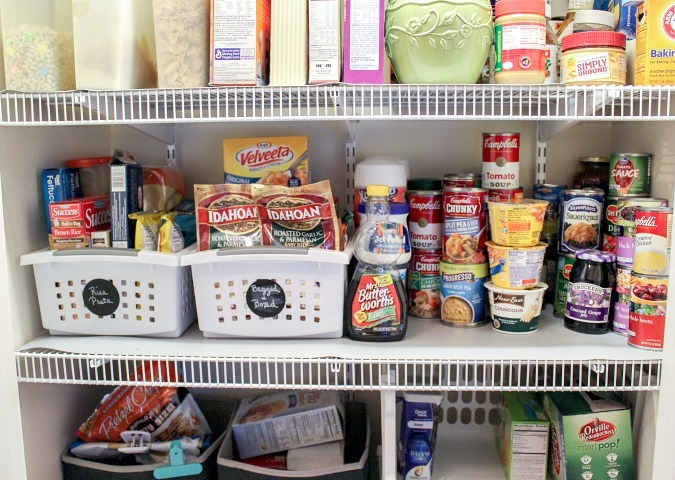 Let’s start with my pantry, shall we? 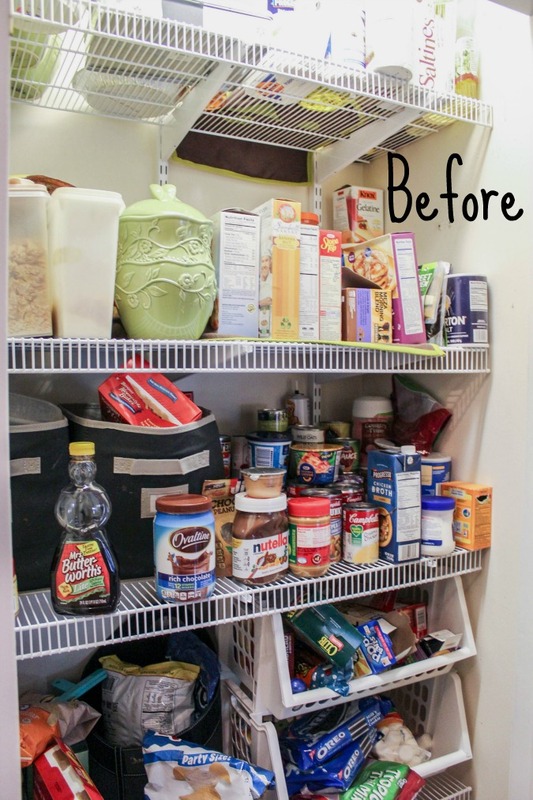 These first two pictures were the state of my pantry before I got started. I had already began to clear out what is on the floor before I thought to take a picture, so the floor is looking really empty. But trust me, it was jam packed full of things. For this part of my declutter and organization, I chose to work on one shelf at a time, starting with the floor. I felt like it was less overwhelming this way. So, starting with the floor, I emptied everything out, and then I began purging things. I looked at the dates on everything, and threw all expired items away, and then I purged food items that I knew we had not and would not be eating. This purge filled an entire trashbag! 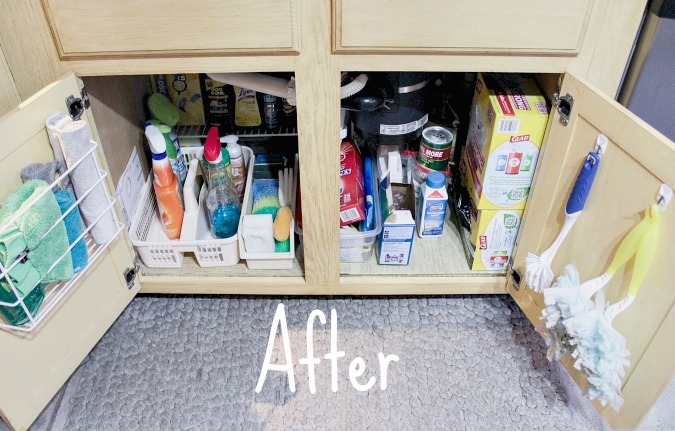 It was my first major clean up in the pantry in about two years. So it was overdue. Our pantry was not actually a pantry at all when we moved into this house, it was a coat closet. There actually was no pantry. One of the first things I decided was that this coat closet was going to become our pantry. It is literally right outside of the kitchen, so the location was perfect. We purchased a portable closet that is housed in a large closet in our garage that now serves as our coat closet. It totally works for us. 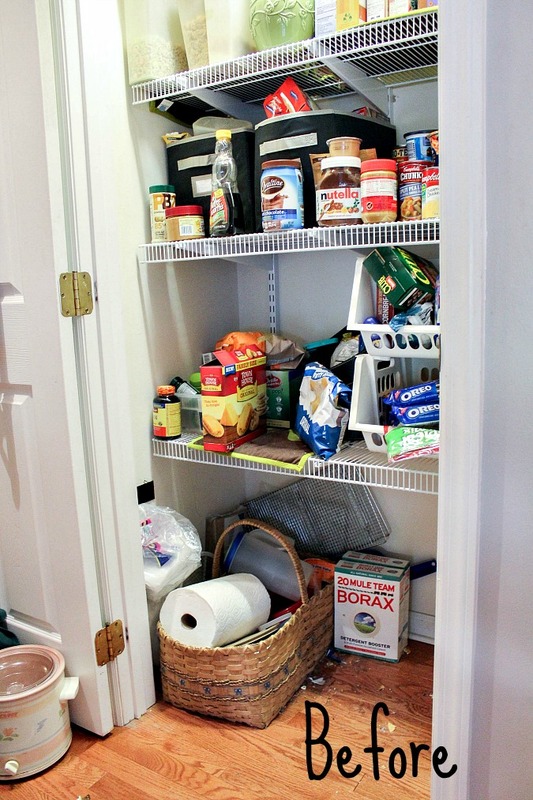 So we purchased this pantry kit from Home Depot and installed it. I know some people are not fans of a wire closet, but it is what we could afford at the time, and I don’t mind it. Only 4 items were purchased for this organization project, and these two white baskets are two of them. They are now holding rice, pasta, and boxed and bagged meal items. I added little chalkboard labels to them so that the rest of the family will know where these items belong. On the shelf next to the white baskets is our drink mixes, our canned food, jarred food, and the syrup because it is used daily and this is the easiest place to grab it. Little guy literally eats pancakes for breakfast every morning, no lie! You may have noticed that I lined the shelves. This is another item I purchased for this project. I bought this for two reasons. One, it keeps spills and/or crumbs contained, and two, it helps things sit on the shelving better. I just measured this and cut it to fit each shelf. This will be easy to wipe clean when needed. These next two pictures are the top shelf, and the next shelf down. On the top shelf, the left side contains mostly baking products. You can see here that most of these things have been transferred into different containers. I have two different sets of canisters that I have kept when I bought new ones for my kitchen in the past. I use the canisters to hold baking ingredients, such as powdered sugar, etc. This works very well for me because being that I am not a baker at heart, I don’t use them often. And they stay fresh this way for longer. To the right you will find cooking oils, vinegars, and things in bottles. I did a major purge on this area and most of it went in the trash. 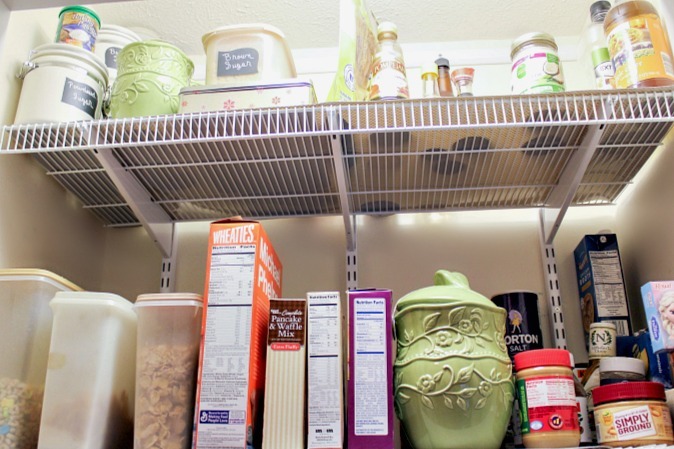 Below that is the shelf that houses our cereal, oatmeal, pancake mix, peanut butter and Nutella. And there are a few other odds and ends in this area. The green canister contains my husband’s oatmeal, which he loves to eat for breakfast. I keep most of our cereal in Tupperware containers that I have had for years. These containers keep cereal fresh for so much longer, and I highly recommend them! We always seem to have one box of cereal more than the containers I have though, so I should probably buy another one. The bottom shelf is reserved for snacks. These two black bins used to hold boxed/bagged meals and our rice and pasta. But I didn’t really think it was working out. They are large bins, and deep. We were having a difficult time seeing what was inside of them on the shelf above, so I decided to purchase the two white baskets you see above for these items. I moved the two black bins to the bottom shelf to contain our chips and crackers. It works so much better this way. Since they are on the bottom shelf, we can see everything that is in them, and it gives us more room for snacks, which were overflowing. I also decided to store our extra bag clips right on the side of the bin. We are always searching for them in our drawers. so this just makes more sense to me. They are now right where we need them. These large stacking baskets right next to the black bins have been here since my last pantry organization, and they have worked out perfectly, so they stayed. They also contain snack foods and popcorn. Next up is the floor space. I would love for this space to be virtually empty, but alas, this kitchen and this house in general lacks storage, so I have to utilize every square inch of this closet. My last purchase for this space was the storage drawers you see here. 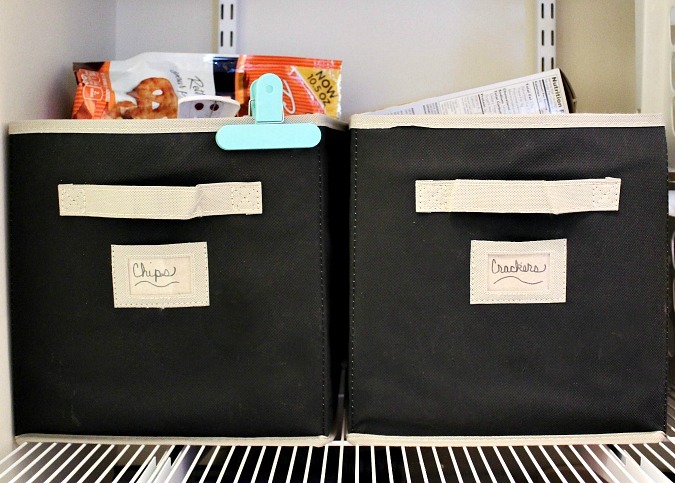 Two of the drawers contain different lids for our food storage containers. And the middle drawer holds all of our K-cups. My husband even made a point to tell me about a week later how much he loved having a drawer for his coffee. So it is working for him! 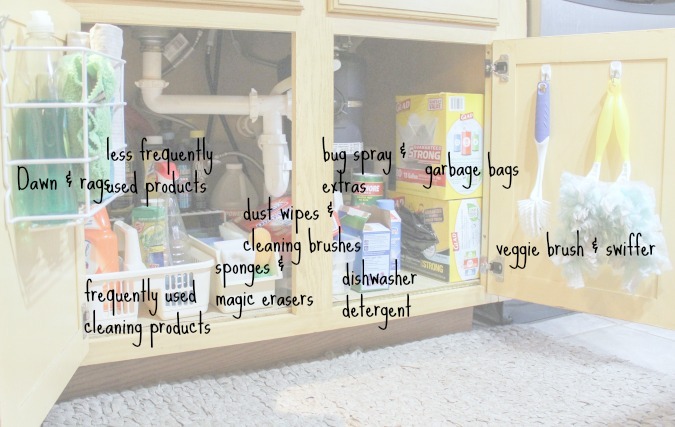 On the top of the drawers I have a small broom and dustpan, our brown paper lunch bags, and a bag of baking soda. The large green bag you see is full of other shopping bags, and these are the bags that I take when I go grocery shopping. I hate using the plastic bags at the store, I just think they are so wasteful, so I switched to these gradually. Now, I just grab them and go as I am walking out the door. Underneath of those you will find our waffle iron and crock pot. The basket on the right of the floor contains paper towels and napkins, extra pitchers and my husband’s protein. It might not look pretty, but it is working great for us. It would look a whole lot less cluttered without the bags, but I wanted to keep them there so I could mention them in this post today. I feel so good about myself and what I can do to help out the environment every time I use them. You can get more into them, so you have less bags, and they are easier to carry. 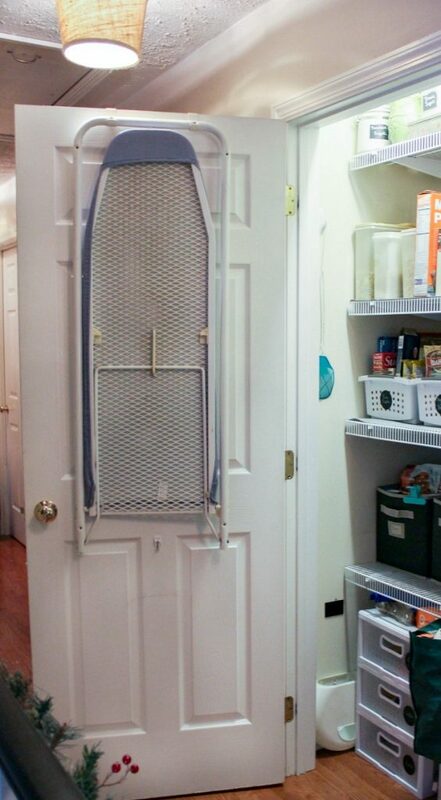 We also house our ironing board on the back of this pantry door. It is in a centralized spot, and we do not have room to have an ironing board sitting around our home. So this one just folds up when we are finished using it. I have owned this ironing board for 24 years, and have no plans of parting with it anytime soon. 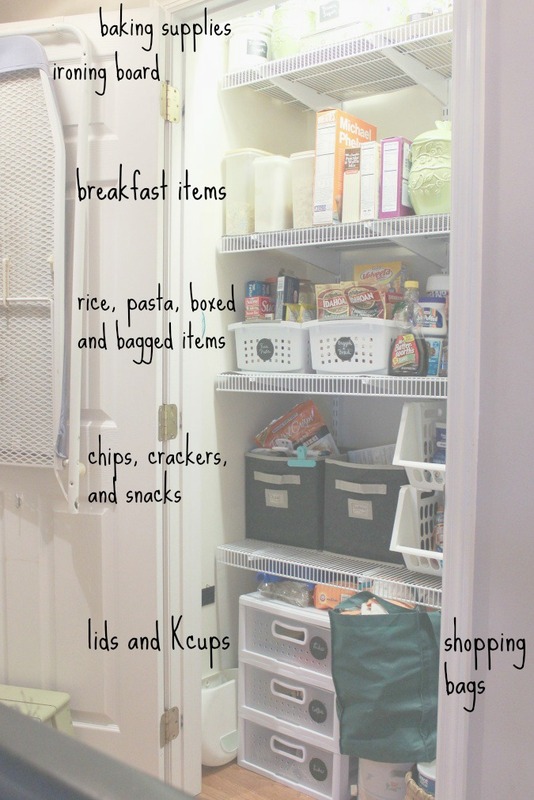 I hope some of these tips and tricks will be useful to you if you are in need of reorganizing or purging your pantry! This is one task I am so happy to have checked off of my list, that is for sure! 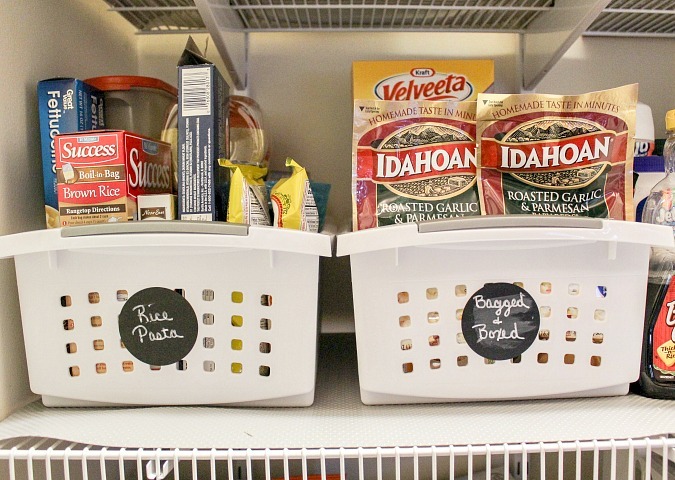 I will probably add a few more organizational bins or baskets at the time of the next pantry purge in a couple of years, but for now this totally works for us! 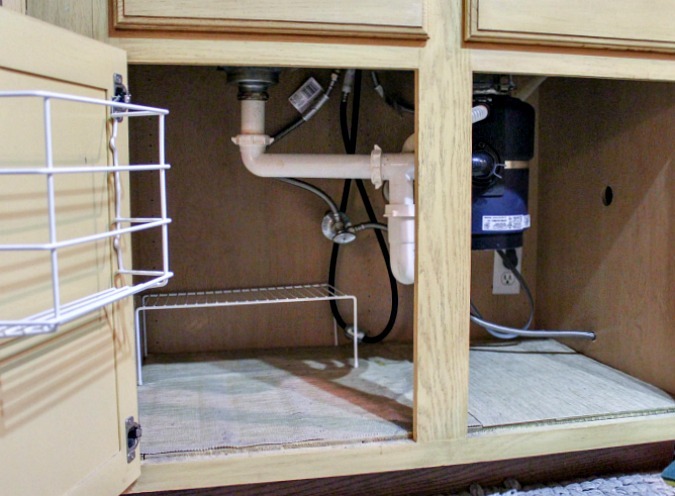 The next area that was badly in need of a purge is our under sink area. You can see the finished result all labeled for you below. These next two pictures below are before pictures. I allowed this area to get out of control in recent months, and I’m so happy to say I have it back in order! The first thing I did was clear it out and clean the space. Preparing it for a clean slate is always helpful when purging. And below you can see all of the stuff that was under here. I can’t believe how much I had! I started by going through each and everything and deciding whether to keep it or to throw it away. If I had not used it at all in over a year, I tossed it. I also had duplicates of some things, so I combined them whenever possible. And here it is all finished and organized! I did not purchase a single item for this project, I simply purged a lot and then started putting it back in. I also reorganized things as I put it back into the cabinet. The hanging basket on the inside of the left cabinet door is something we installed the last time I organized this space. Initially it housed cleaning supplies, but it has fallen off of the door a few times, so I decided to lighten the load and use it to store all of our cleaning rags. 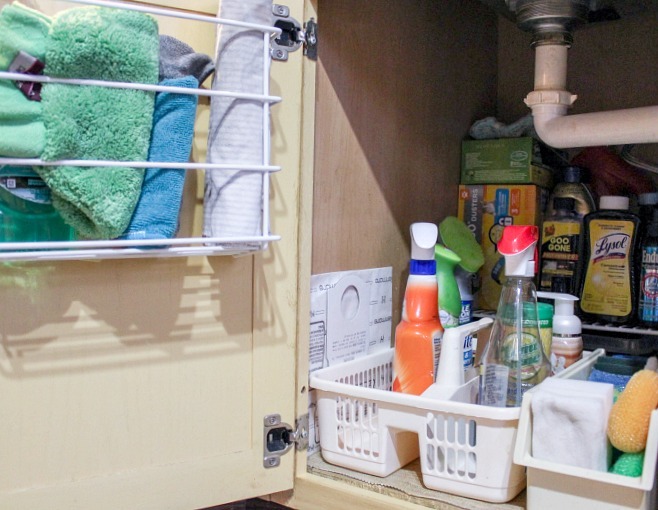 It also holds our dishwashing liquid for easy access. I am reaching for it a lot, and this spot makes sense for it. 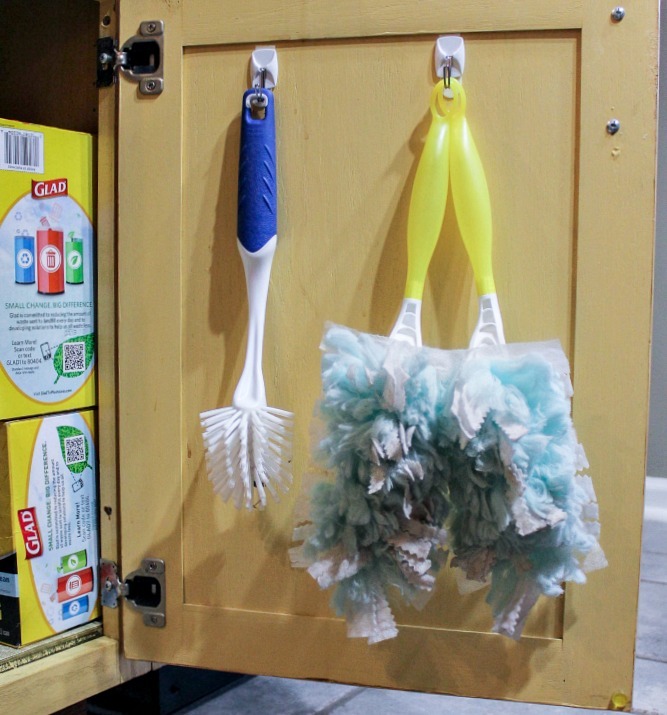 On the right cabinet door we hung our veggie brush and our Swiffer cleaners. The caddy in the picture below has been with me for many years. It has a handle and I can just pick it up and carry it to a different space whenever I want to. I keep our most frequently used cleaning products in this caddy. Right behind the caddy, I have a wire shelf that helped to increase our storage. We keep things like a box of brillo pads underneath, and on top of the shelf are less frequently used products or refills. 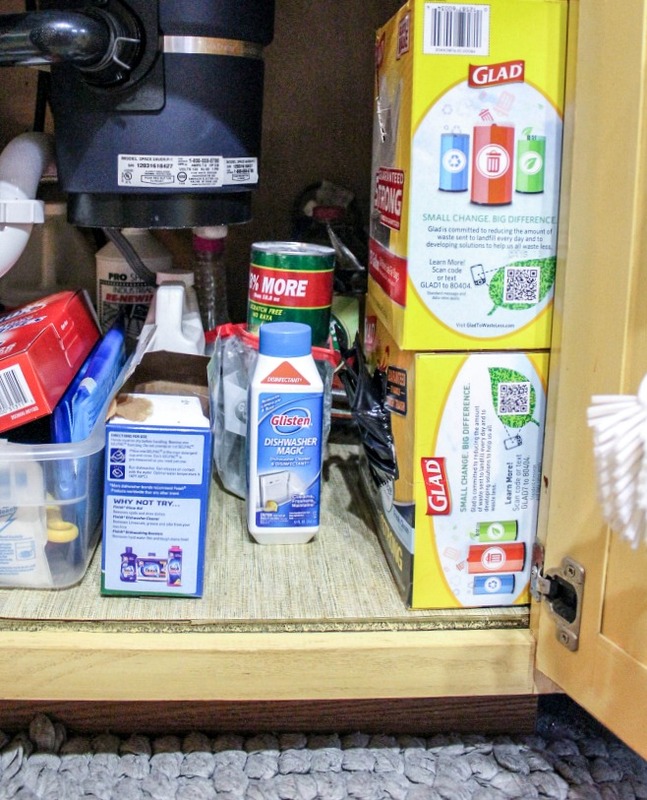 To the right of the caddy is a small container that holds all of our sponges and magic erasers. This container is actually an ice tray from an old refrigerator. To the right is where we keep our trash bags, our dishwasher detergent, bug spray, floor cleaner, and other miscellaneous items. Our vacuum cleaner bags fit right between the caddy and the wall, and it is easy to find one when I need one. And one more after shot for you! Like I said earlier, not necessarily pretty, but decluttered and organized, and I am very happy with the end result. I feel like a weight is off of my shoulders! Now, please pay a visit to my fellow hosts for this challenge by clicking the links below this picture. 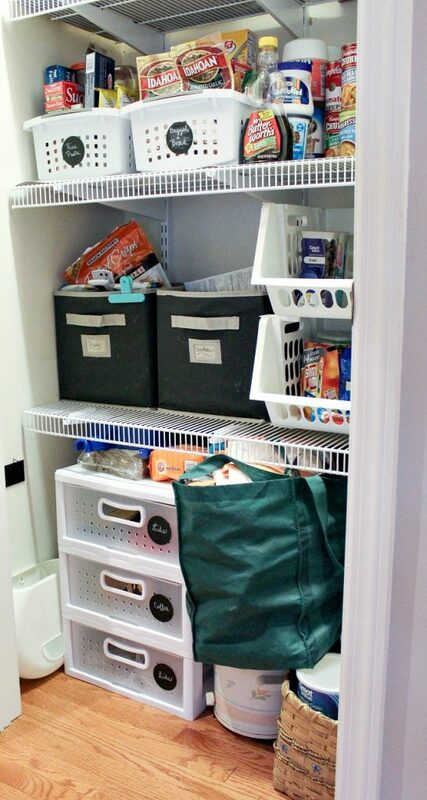 They have some amazing ideas and incentive to organize your home! 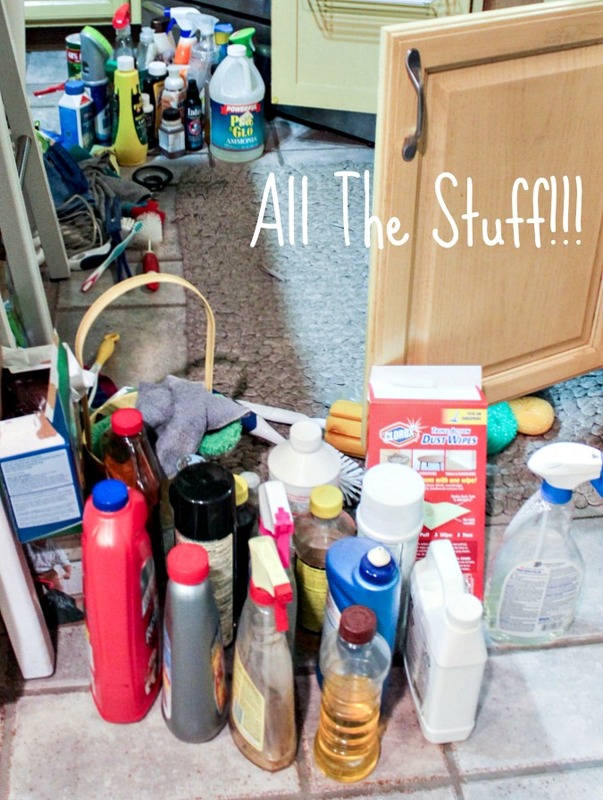 We would love to have you join our link party and add a link to a post you have written about kitchen organization. You can even add a picture if you don’t have a blog! And don’t forget to register to win the gift card at the bottom of the post! You do not want to miss out on that opportunity! For your convenience, this post contains affiliate links. If you click on them and purchase an item, I will receive a small percentage of commission. By clicking the link, you are NOT paying any more than you ordinarily would, and you are helping support me in keeping this blog up and running. 1. 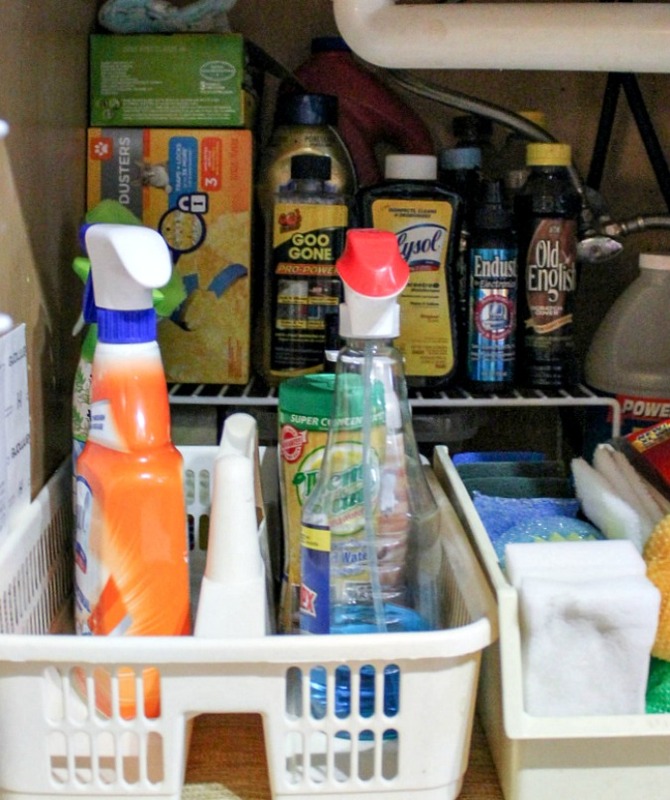 Please only link up posts that are kitchen decluttering/organizing related. 2. Please only link up your original work. 3. Please only post something that you have not posted before during this 4 week challenge. 4. Please go to the original post before you pin something. 5. By linking up to this party, you are giving all 8 of us permission to share your pictures on social media or our blogs at any time in the future. Of course there will be a link back to your original post if used. 6. Please follow all hosts. 2. Follow the rest of the Rafflecopter prompts below.